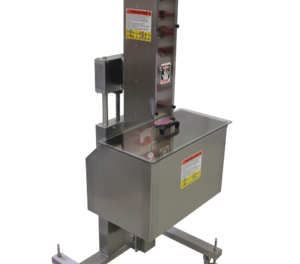 Easy-load® small foot-print Cap and Parts Elevator that mounts directly onto Kaps-All Cappers or available with its own mobile floor stand for use with other machinery. Three (3) cubic foot capacity stainless steel hopper. Clear Polycarbonate dust cover over vertical belt. Four (4) cubic foot hopper to replace standard Three (3) cubic foot hopper.